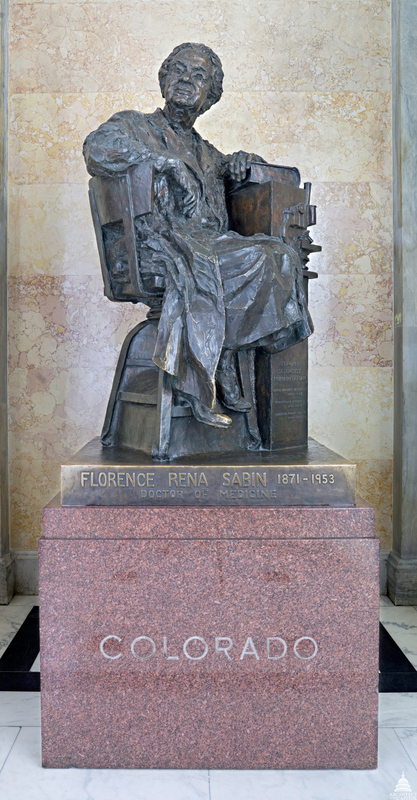 This statue of Florence Sabin was given to the National Statuary Hall Collection by Colorado in 1959. A pioneer in science and public health, Florence Sabin was born in Central City, Colorado, on November 9, 1871. She graduated from Smith College in 1893, attended the Johns Hopkins Medical School, and was the first woman to graduate from that institution. In 1902 she began to teach anatomy at Johns Hopkins. Appointed professor of histology in 1917, she was the first woman to become a full professor at a medical college. In 1924 Sabin was elected the first woman president of the American Association of Anatomists and the first lifetime woman member of the National Academy of Science. In September 1925 she became head of the Department of Cellular Studies at the Rockefeller Institute for Medical Research in New York City. Her research focused on the lymphatic system, blood vessels and cells, and tuberculosis. In 1944 she came out of a six-year retirement to accept Colorado Governor John Vivian's request to chair a subcommittee on health. This resulted in the "Sabin Health Laws," which modernized the state's public health system. In 1948 she became manager of health and charities for Denver, donating her salary to medical research. She retired again in 1951 and died on October 3, 1953.